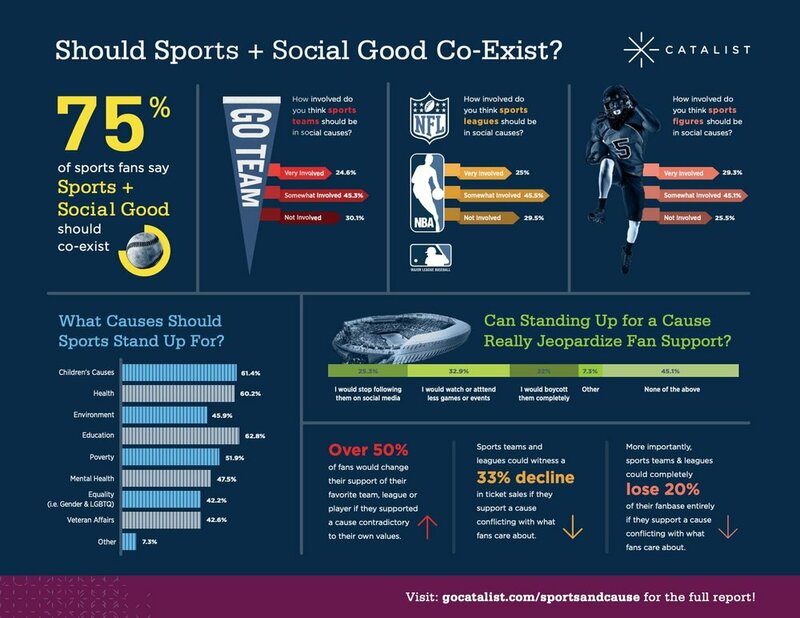 Join Catalist’s Brittany Hill for a FREE one-hour webinar on February 21st that will highlight the findings from its 2018 research surveying over 1,000 Americans to better understand their perceptions and affinities toward the intersection of sports and social good. Signup HERE. Pro-athletes have always used their high profile to raise awareness for social injustices (e.g. Muhammad Ali, Bill Russell, Kareem Abdul-Jabbar, Jim Brown, Arthur Ashe and Billie Jean King). But we are truly witnessing a new day when a league or team’s bottom line will be directly impacted by their social purpose. Americans want more from our favorite coffee brand than to just a great cup of coffee. We want them to be environmentally, fiscally and socially-responsible. We want them to create actual change in our communities. We expect the same from our favorite sports teams. But what does that actually mean? Can standing up for a cause really jeopardize fan support for their favorite athlete or team? At Catalist, we love finding answers - ones that will help us all do a little more for each other. At the end of 2018, we conducted a survey of over 1,000 Americans to determine if sports and social good belong together. We know there are a lot of other factors driving declining event attendance across leagues, or increasing sponsorship dollars for some, or contributing to overall revenue peaks and valleys. But we’re convinced that the difference between a good team and a great team is the latter’s commitment to the communities that support them. And you know what? Americans agree! 1. Accept your role. Our study found that 75 percent of Americans believe that sports organizations should be involved in social causes. Americans want your team to stand for something. They want teams, leagues and players to have a voice when it comes to inequalities and economic disparities. Americans look to their teams not to just score touchdowns, but to be beacons for change in our communities. 2. Find the right cause. Sports organizations must identify the right social cause to support. They can learn a lot from their fans. Our study found that over half of fans would change their support of their favorite team if they supported a cause contradictory to their own values. A third of fans would watch or attend fewer games and 22 percent would completely boycott the team. The top five causes Americans want the sports world to support are: Education, Children’s Causes, Health, Poverty and Mental Health. 3. Communicate the impact. Standing for an issue in an ad campaign or supporting one community event is just one down in what is a long game. Short-term plays won’t score a touchdown unless we know what type of change you are making in the community. Are you measuring your community impact? Are you taking concerted and consistent steps to notify your fans of your good work? Do you know how fans even feel about your community relations or philanthropic activities? The best way to deepen your relationship with fans is to communicate how you are helping the community in which they live. Budding partnerships like the NFL’s work with Big Brothers Big Sisters during Super Bowl LIII are a great sign of things to come. We love hearing about how sports organizations are formalizing their purpose-driven strategies and creating strong connections with their communities. The challenge to the sports world at-large is to embrace their role as agents of change and to carefully measure and communicate their impact. This is a game at which every team can be a winner. This post is sponsored by Catalist. Catalist uses smart technology, insightful data and industry expertise to match companies with causes in partnerships that accelerate social change. Learn more about Catalist here.